Dang it, Wally! And Emme! This is how they spent their Saturday morning. I hope it was worth it. Awww… They love you. 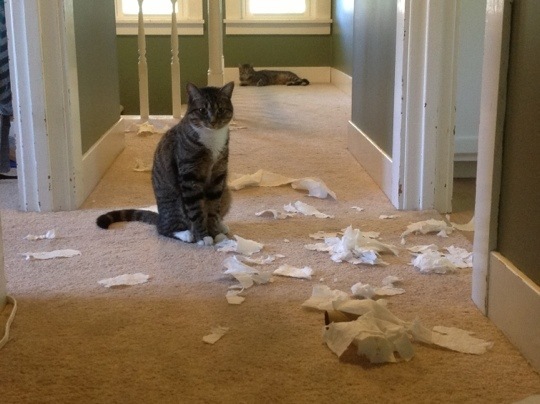 They were helping make the floor softer by spreading shredded paper bits all over it. Were they upset with you or Lloyd -- our cat does that when she’s mad at us. I’m amazed at how a cat will sit right in the midst of the wrong doing…..proudly. A dog would be no where near the sight of the mischief. Looks like they completely finished the roll. Not even one square left on it.